Collections in EasyWorship help you organize your resources to make them easier to find and access. You can create Collections in any of your resource tabs: Songs, Scripture, Media Presentations, or Themes. There are two different types of Collections: Collections and My Collections. These can be viewed by any user who is logged into the computer or network that is using that EasyWorship database. If you ever backup your database, Collections will be backed up with it. 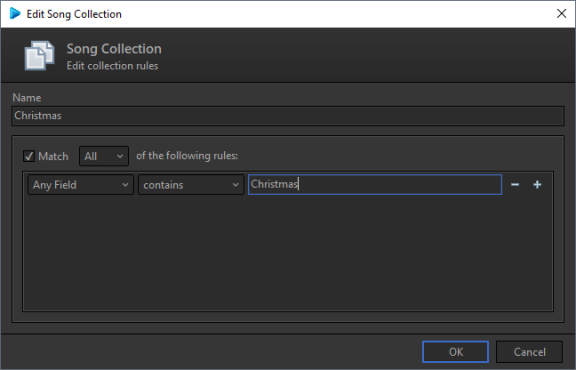 These are private collections that can only be viewed by the Windows user that is logged in on that computer when the My Collection is created. Any other Windows user or network user accessing that EasyWorship database will not be able to see it. If you ever backup your database, My Collections will not be backed up with it. If you want to create a collection in your media, but you want to keep your images and videos separate, you can create a folder called Images and a folder called Videos. Under each of those folders, you can create other folders and collections. So, under the images folder, create a folder called Easter, then create collections under that folder called Crosses, Palm Branches, Tomb, Risen… You will then add your images to those collections. You don’t have to create folders to create collections, but you do have to have a collection to add resources to it. You cannot add resources to a folder. And, if you have a folder with different collections underneath it, selecting the folder will show all resources from those collections under that folder. Select the desired tab, where you want to create a collection (Songs, Scriptures, Media, Presentations, or Themes), in the Resource Area and click the ‘Add’ icon in the bottom left corner. The Collections menu shown here will appear. To edit the Collection, double-click the desired Collection or right-click the Collection and select Edit…. This will open the Edit Song / Scripture / Presentation / Theme Collection window. In this window, you can edit and name your Collection and filter your Collection contents. Check the box next to Match and use the drop-down to choose All or Any of the following rules. Using the drop-down menus, select the desired options and enter the text by which to filter your results. You can filter by Title, Author, Copyright, Administrator, Words, or Any Field. Click the ‘Add’ icon to add additional filters to this Collection. Click OK to filter the songs in the Collection and return to the main window. You will see the filtered results now contained in that Collection. If you have directories in your Resources folder for EasyWorship on your computer that already have the videos and images sorted, you can create collections and filter them by those directories. To manually add items to a collection, click on the main image or video library and drag and drop the items you want to the desired collections. When deleting items from a collection, you will be asked if you also want to permanently delete it from your library. If you don’t check the box to do that, the item you deleted will still be available in your library and will only be removed from your collection. There are many benefits to creating collections and folders. It will save time when you’re trying to find that perfect image or video for your service, especially if you have hundreds or even thousands of them in your library. Visit our Collections Training Video or Help Article for more information about collections.